We constantly hear the cry ‘lack of demand’. The economic crisis is ‘caused’ by a demand shortage & the ‘solution’ is more demand has to be ‘created’. Furthermore, we are in a ‘liquidity trap’ so no matter how much interest rates are lowered, businesses still do not expect to get a profitable return on their investments. Their ‘animal spirits’ are so low that government intervention is required to stimulate the economy & restore their optimism. Then capitalism can carry on in its merry way & with the right kind of government intervention the economy can be stabilised & crises consigned to history. 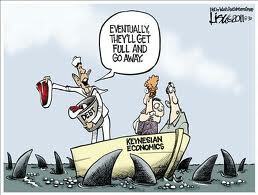 Keynesianism, like the rest of modern economics, is based upon marginalism. This is a subjective theory of value that says that the price of anything is due to its relative scarcity. The ‘price’ of money is the rate of interest (r). If the expected return from capital investment is lower than the cost of money capital (r) then there is no rational reason to invest. Keynes called the expected return from capital the marginal efficiency of capital (MEC); it is effectively the same as the rate of profit. So for there to be profitable investment & economic growth, the MEC must be higher than r. The leaders of business, entrepreneurs, are a fickle bunch according to Keynes, & are prone to bouts of pessimism about the future. Consequently the MEC periodically falls, investment slows & a crisis ensues. Marginalism, being a subjective theory, resorts to psychology to explain crises. Is this the best it can do?